This weekend saw the FA Cup 4th Round take place. The snow cause havoc across the country, with 8 of the 16 ties postponed. However, we got to 3 of the 8 games as teams battled it out for a place in the 5th Round draw. The Academy Stadium played host to the first FA Cup game of the weekend as Manchester City hosted Watford. After a brilliant defensive display from the Hornets, City eventually scored three second-half goals to see them through to the next round. 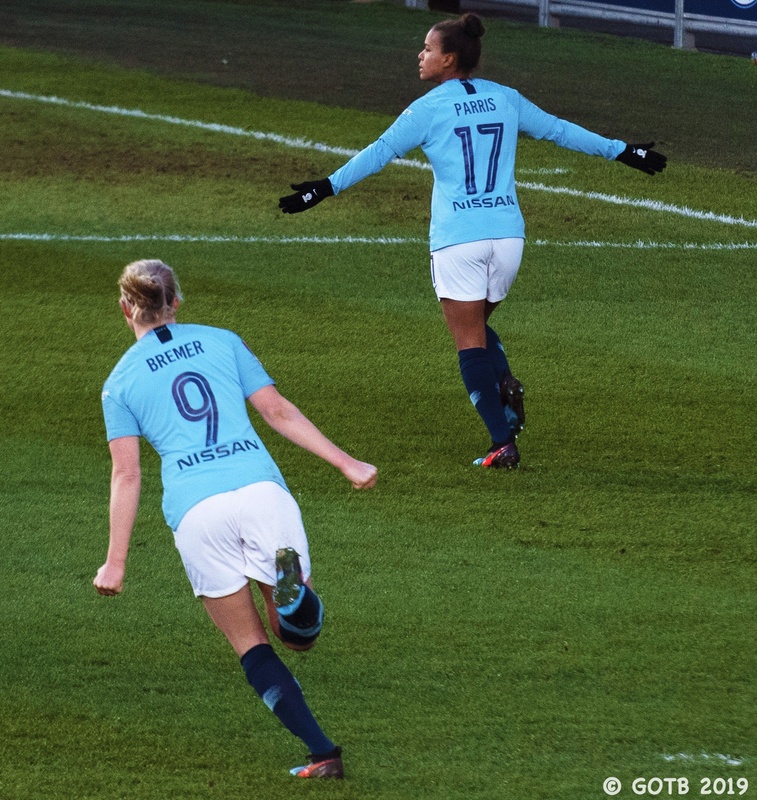 Substitute Nikita Parris scored a brace before Pauline Bremer got the third in the 86th minute. Watford’s goalkeeper, Weronika Baranowska, deserves all the plaudits after making several brilliant stops across the 90 minutes. In the first half, she made a finger-tip save to deny Keira Walsh’s dipping 20-yard effort before producing an equally smart stop to keep out a stinging angled shot from Jess Park at close range. Baranowska was on hand again in the second half, with the highlight being her triple save to deny Parris her hat-trick. There is no doubt that she kept her side in the game throughout. Armand Kavaja set up his Watford side to try and frustrate City. While not offering much in attack, defensively the Hornets were solid and were able to handle City’s consecutive attacks. They were under considerable pressure in the first half, but their defensive line remained solid. 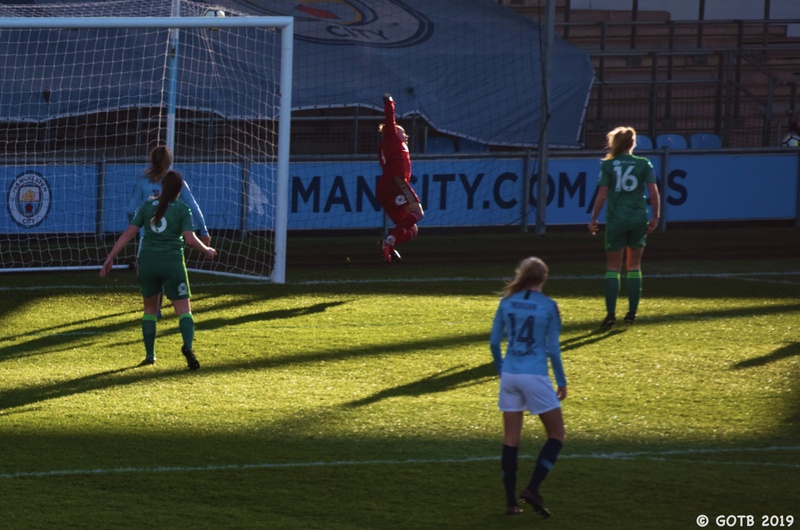 City had most of their joy down the left-hand side, with Esme Morgan and Lauren Hemp combining, but whenever they got into the box, there was a defensive block from Watford waiting. They inevitably tired a bit in the second half but despite conceding, still made life difficult for the hosts and can take home plenty of positives from the game. Nikita Parris has to be lining herself up as a serious contender for Player of the Season with her performances this campaign. Her introduction in the second half changed the script and gave Manchester City the impetus they needed to get the win. Her movement added another dimension to the City attack, making the difference after only six minutes on the pitch. With a goal that showed her pace, strength and intelligence, she broke onto Pauline Bremer’s ball and held off her defender before converting from inside the box. Her second goal of the afternoon was just as good, latching onto a smart lay-off to fire past Baranowska. She could, and probably should, have had a hat-trick but for some very unselfish play that saw her look for strike partner after being played through on goal. Two big positives for City will have been the performance of Pauline Bremer and the return of Megan Campbell. After breaking her leg in 2017, Bremer has only just come back to the City side. Having had a header ruled out for offside in the first half, she set up Parris for the opening goal. It didn’t look to be her day with a couple of missed chances. However, with four minutes left to play, she converted from inside the box to notch her first goal since her return. After 15 months out with an ACL injury, Campbell made her return to the pitch with an appearance off the bench. The Irish international adds a different quality to this Manchester City side and her skill at long throw-ins is unquestionable. Brighton hosted Manchester United at Crawley Town on Sunday. United’s last match had been early in January when they knocked West Ham out of the Continental Cup. Casey Stoney will have had confidence that her squad could replicate that outcome against a Brighton side that have struggled this season. After a scrappy first half, the game came to life when substitute Lauren James gave the visitors the lead in the 51st minute. Brighton had their chances to level, including a spot kick, but United secured their progression when James hit again late in injury time. After a poor first 45 from both sides, the managers each made a half-time substitution. Stoney brought on 17-year-old Lauren James and she had an immediate impact. Her first goal saw her finish off a strong forward run from Jess Sigsworth, but the second goal was all about her. Picking up the ball inside Brighton’s half, she did circles around Victoria Williams to enter the box. She finished the move with aplomb, sending the ball low into the far corner. James has been receiving all kinds of praise for her performances this season and it is easy to see why. With all the natural skill at her disposal, she can make the game look incredibly easy and both goals were examples of the threat she can present. 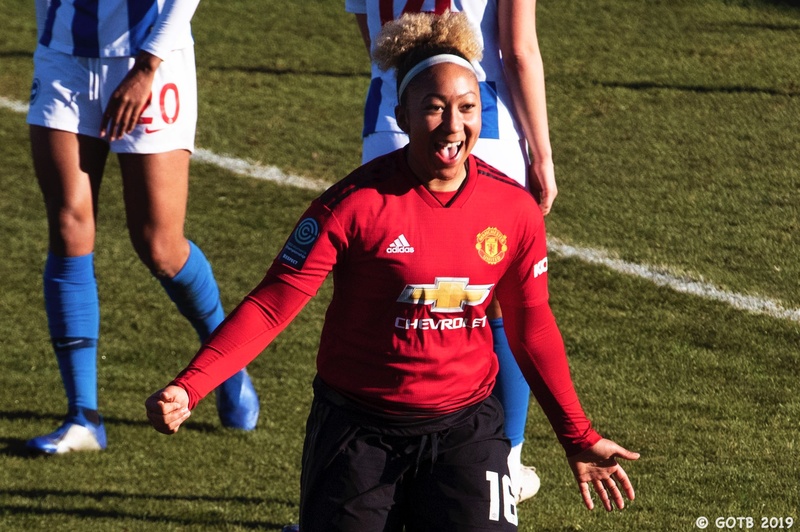 United’s performances throughout the season have meant Chamberlain hasn’t been troubled too much but she has proved when called upon that she has the quality to make the important stops. On Sunday, she made two huge stops to keep her team 1-0 up and ensure they progressed to the next round. When Aileen Whelan broke into the box unmarked in the second half, she stayed big to block the shot one-on-one. Then, with 80 minutes on the clock, Kayleigh Green raced through and was brought down by Amy Turner in the box. Chamberlain once again came up with a huge diving save to prevent Danielle Buet’s spot kick from going in. With United currently playing Championship football, it was a little surprising Brighton kept sitting back, particularly in the first half. They were allowing the United back-line all kinds of time on the ball which gave them an opportunity to dominate. Going forward, they relied on the long ball towards Umotong all too often and the other attacking players were not able to impose themselves on the game. Conceding seemed to spark the hosts a bit more into life and the introduction of Kayleigh Green added an additional threat. She had the energy and speed to start hassling the United defence and it led to the penalty. Our final game of the weekend saw us to make the short trip across town as Crawley Wasps hosted Arsenal. 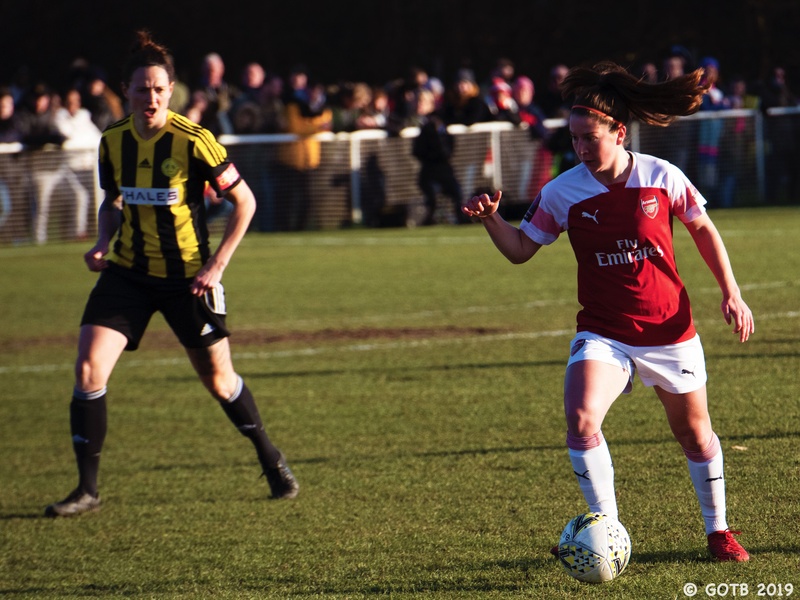 33 league positions separate these teams – Crawley Wasps have been lighting up the FAWNL Division 1 South East this season while Arsenal sit second in the FAWSL. Two goals in each half sealed the win for the Gunners. Kim Little opened the scoring before Ruby Grant netted a hat-trick to send her side into the next round. Oakwood FC played host to a quintessential FA Cup tie as a 1,500-strong crowd turned out. It was the perfect ground for such an occasion, with the crowd close to the pitch to provide as much support and energy as possible to the home side. It really was what the FA Cup is all about. Joe Montemurro named a side that mixed youth with experience, giving playing time to several of his youth players. Ruby Grant, Hannah Dawbarn, Melissa Filis and Ava Kuyken all started for the Gunners while Amelia Hazard and Ana Caterina Albuquerque came on from the bench. Grant shone up front. The 16-year-old netted her first hat-trick with three fine finishes and ended as player of the match. We are sure to see plenty of her in the future. Paul Walker can be incredibly proud of the way his side acquitted themselves across the 90 minutes. They made life difficult for Arsenal throughout and held it together where other teams have fallen apart against the same opposition. The Wasps have been enjoying a brilliant season, unbeaten in the league and sitting at the top of the FAWNL Division 1 South East after only being promoted in the summer. You could see the confidence they had in each other and could have had a goal in the second half. Faye Rabson broke one-on-one with Sari Van Veenendaal but the Arsenal keeper produced a big stop with her legs to keep her clean sheet. Tagged arsenal, brighton & hove albion, fa cup, fa cup magic, fa women's cup, football, football blog, manchester city, manchester United, sse fa women's cup, Watford.